On the 2nd June 1978 history was made at the Football League’s Annual General Meeting held at the Café Royal in London. Every year the clubs got to vote on whether the teams who had finished at the bottom of the then Division Four would be “re-elected” to the Football League for the following season, or replaced by a team from the Non-Leagues. There was no formalised pyramid as there is today with any club who felt they had the resources able to make an application to join the league. In the previous decade, clubs such as Chelmsford City, Romford, Gravesend & Northfleet and Altrincham had made applications to get into the league without success, with the advantage always with the league sides. That was until 1977 when Workington were voted out of the league, having finished adrift at the bottom of the Fourth Division, replaced by Wimbledon FC. However, it was events on Regent Street a year later that would be remembered in the annuls of footballing history. They would be joined in the vote by Bath City and Wigan Athletic, the two representatives from the Southern and Northern Leagues respectively. Wigan hadn’t even won their league, finishing runners-up to Boston United although they were no strangers to playing their hand in trying to gain election, having made 34 previous applications. In the first round of voting, York City, Rochdale and Hartlepool United topped the voting, meaning they were safe, whilst Bath City received just 21 votes and were discounted. But Wigan Athletic and Southport both gained 26 votes meaning a second vote was needed. Unfortunately, Southport lost by 29 votes to 20 and were ceremoniously kicked out of the league, the last club ever to suffer the re-election fate. The fans blamed the trumpet-playing pub landlord and chairman, Walter Stanley Giller although Wigan Athletic had been very canny in their campaigning, bringing in former England Manager Sir Alf Ramsey to help influence some of the voters – every Football League club got to vote, not just the teams in Division Four and he was still a revered character in English football. Almost forty years later, Southport were lining up against Lincoln City in the Conference Premier in the final game of the regular season. 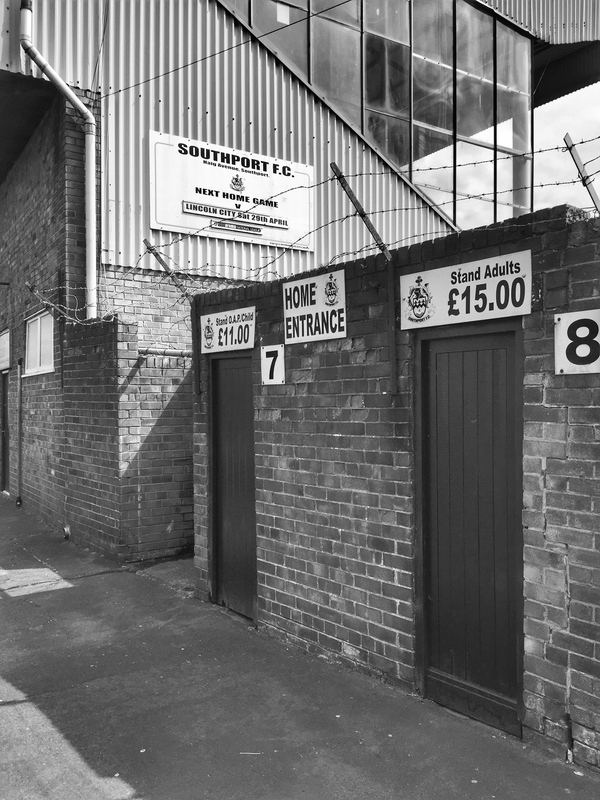 In just a few months time the two clubs would be playing their football two divisions apart as the Imps would be returning to the Football League after a six-year hiatus whilst Southport would head in the other direction after seven years at the highest level of Non-League football. Since that June day nearly 40 years ago they’d rarely come close to returning to the Football League – a 3rd place finish in 1994/95, eight points behind champions Macclesfield Town was the closest they came. 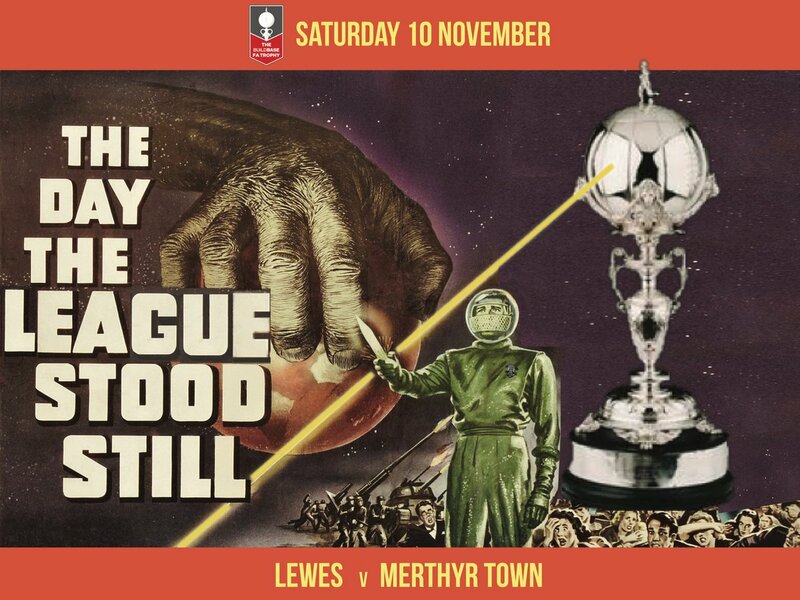 With the Isthmian League season done I could put the stresses and strains of my Lewes role behind me and go back to being a wandering football fan for a few weeks. Come July time and I am itching to get back into action at The Dripping Pan but by the end of April I am looking forward to a break. Don’t get me wrong – I’d have loved for us to be playing 250 miles south in the Isthmian League South Play-off Final but we weren’t (although next year will be different I am sure) and so I could get the footballing map out and find some new grounds to visit. This time last season I saw a double-header in snowy Harrogate Town and Guiseley – this year I would be heading North-West to take one step closer to finishing off the 92 for the third time (after the weekend there would be just Morecambe left to do) and also take in some racing at Haydock Park and Rugby League at Salford Red Devils and their new A.J. Bell stadium. Southport have undoubtedly suffered as Liverpool and Everton have benefited from the ever-generous Premier League revenue streams. As I walked down Haigh Avenue I passed a group of youngsters heading in the opposite direction of the ground – 3 Liverpool and 2 Barcelona shirts, oblivious to the game about to start on their doorstep. Before the season-high attendance, they had averaged just over 1,000, down by around 800 from their Football League days. In the same season that Southport were facing up to life outside the Football League, Fleetwood Town were formed, starting their life in the Cheshire League. Twenty years later they folded, reformed and took their place in the tenth tier of English football as Fleetwood Freeport. They regained the Town name in 2002 and since then they have been on an upward trajectory unlike anything else that has been seen in Non-League football, thanks in main to Chairman Andy Pilley who has run the club since 2004. Their story is one of the only successes of the single investor models. Whilst the soap opera continues to play out at Billericay Town, the carcasses of similar stories litters the Non-Leagues. 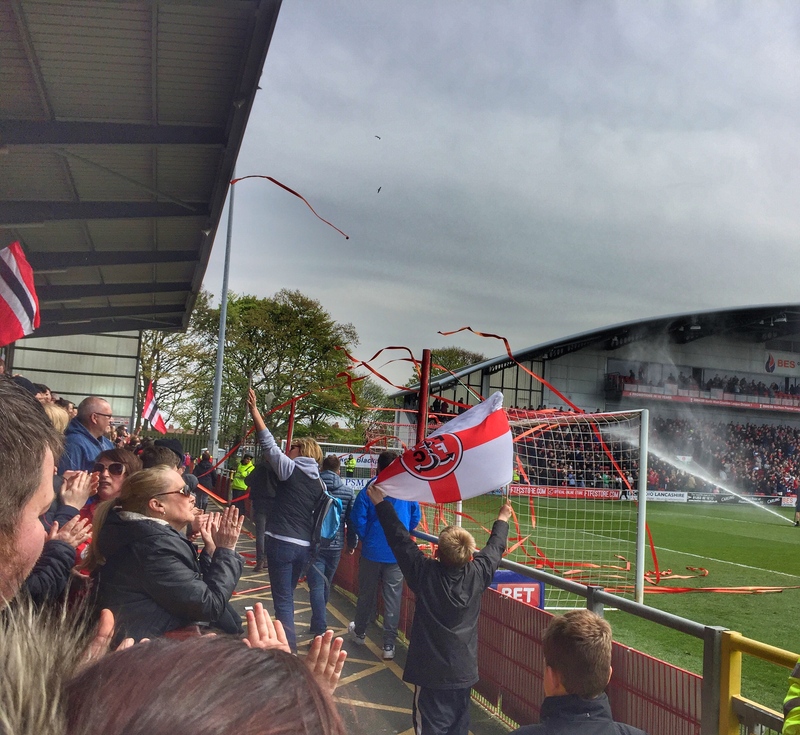 Margate, Kings Lynn and Histon, to name but a few are examples of where such a strategy has gone horribly wrong but at Fleetwood, the success is all too clear to see with a club that is thriving off the pitch as well as on it. The club was promoted five years ago into the Football League, with striker Jamie Vardy leaving at the end of the season for a Non-League record fee of £1m paid by Leicester City. Almost a year to the day of my visit, the club opened an £8m training facilities, putting them on a par with clubs in the Championship. On paper this was a dead rubber with both sides fate already determined. In reality it played out like one. Lincoln City had made a number of changes to their side and consequently none of the urgency that had characterised their games in recent weeks was there. 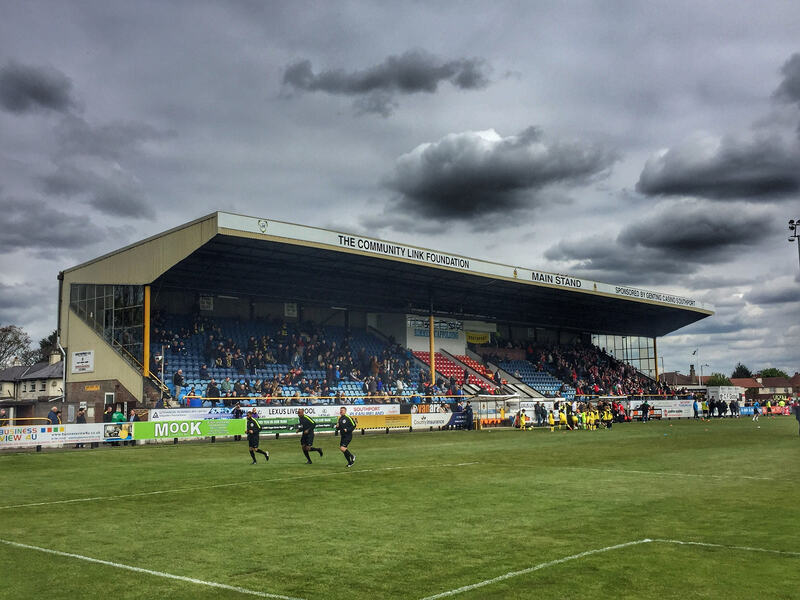 Southport showed in the opening period why they had been in the bottom four for over three-quarters of the Conference Premier season, with the fans seemingly resigned to defeat before a ball had been kicked. 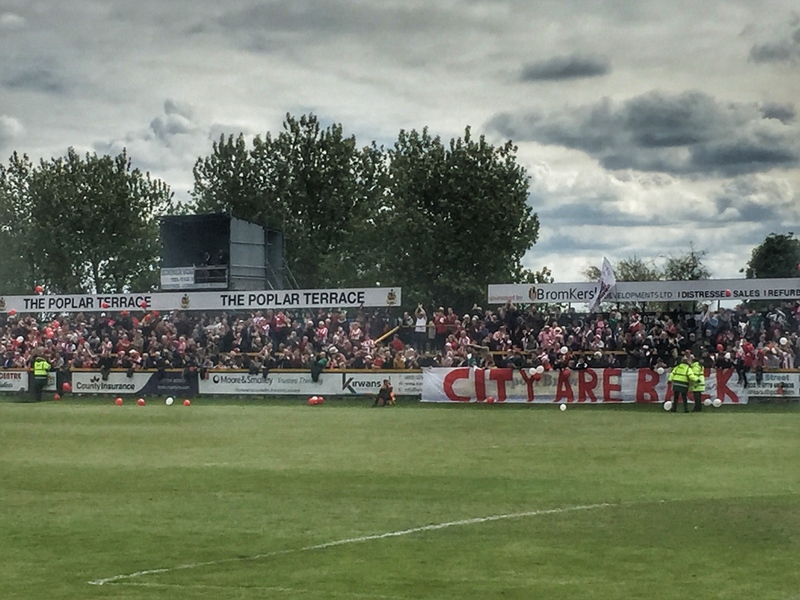 Lincoln City had sold their allocation of tickets, and some more, occupying two sides of the ground and a fair section of the main stand. The home side formed a guard of honour for the Imps as they entered the field accompanied by a riot of red and white from the away fans. 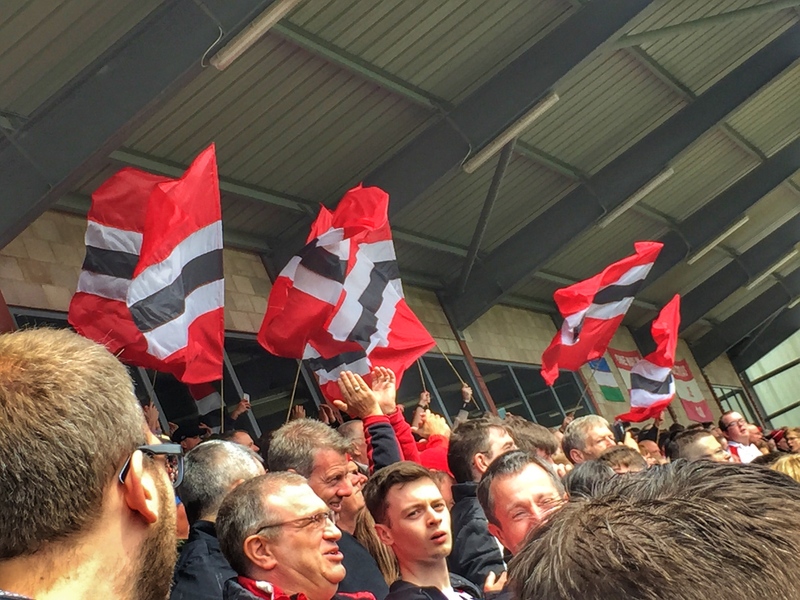 The home fans looked on in envy – relegation would see few such days in the coming twelve months, especially as local upstarts AFC Fylde would be heading the other way. Despite the weakened side, Lincoln City were looking to finish the season on a high, coming into the game on the back of a ten game unbeaten streak. They looked to get the ball wide as often as they could, trying to find space behind the Southport full-backs, whilst the enigma that is Matt Rhead played the pantomime villain to a tee, winding up the home players and fans alike, constantly in the ear of the referee about the treatment he was receiving. On the half-hour his presence in the area caused all sorts of chaos and Lee Angol had the simplest job of putting the Imps into the lead. Back in 1973 when both sides were in the Football League, the crowd was entertained by an appearance from Red Rum at half-time, who had just won his first of three Grand Nationals. Today, we had the excitement of a kids five-a-side tournament and the songs of Coldplay. Don’t get me started about the demise of half-time entertainment…oh OK if you insist then have a read of this. 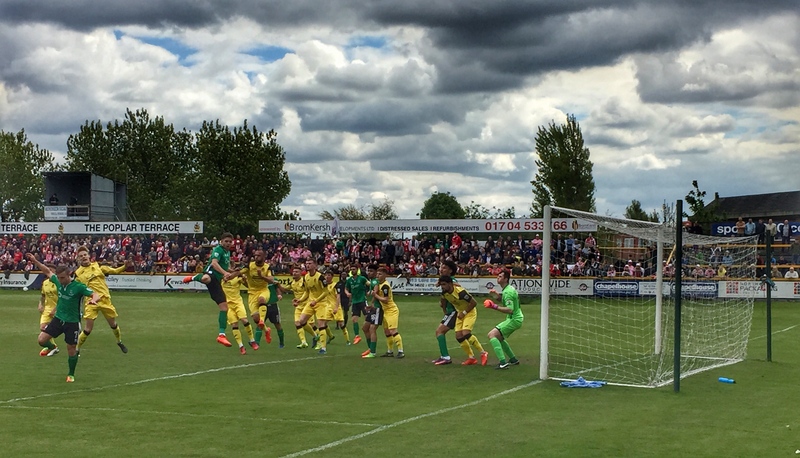 The rest of the game was played with the intensity of a pre-season friendly. The home fans around me on the Scarisbrick Terrace were reading out the teams currently in the Conference North, mentally ticking off where they had been, getting very excited about a day trip to Blyth Spartans, although the claim by one that they were from Blythe in Staffordshire rather than Blyth in Northumberland was amusing to listen to. Just as most of the home fans were getting ready to head home for an afternoon of Jeff Stelling, Southport scored through Neil Ashton. I had made my excuses before the final whistle, heading down to Haydock Park to watch the action on and off the track. Twenty two hours after leaving Haigh Avenue I was on my way into Fleetwood, about an hour north of Southport, past the town’s most famous feature, the Fisherman’s Friend factory. I’d been tipped off that if I could get into the club lounge area then I may meet up with Syd Little, a long-time fan of the club and often seen helping out his wife who runs the kitchen. Alas, with that avenue of pleasure closed off, I headed to the Highbury Chippy, which came highly recommended but like Chessington World of Adventures was a disappointment. Apparently it is under new management but it appears they are yet to get to grips with exactly how long to cook food for. It is rare that you watch a game that is so bad you wish someone had invented a time machine to get those 2 hours of your life back to do something more interesting, like watching paint dry. 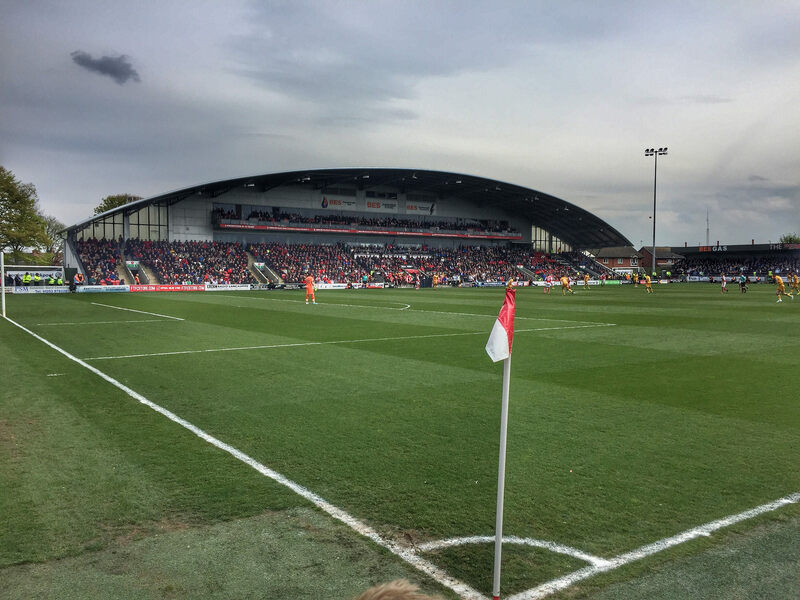 There’s no disrespect in that statement to Fleetwood Town as hosts – after all they had little to play for once Bolton Wanderers had taken an early lead. However, at the other end of the pitch, if I was one of the thousand plus Port Vale fans who had turned up in hope they could get a win, I would have been furious that the team simply looked ill-prepared, tactically inept and completely devoid of motivation. For the home side, they had to hope Bolton Wanderers slipped up for them to have any chance of automatic promotion. Possible, but unlikely. For Port Vale, the maths was much simpler. Better the Gillingham result and they would be safe. The strong cross wind made it difficult for both sides, but it was clear what the issue was from early in the game so why continue to try to plan long cross-balls? Neither keeper really had anything to worry about in the first half bar dodging the litter blowing onto the pitch whilst the fans put on their best smiles for the completely over the top Police presence and their roving video camera man. I cannot really tell you anything of interest in the second half. With five minutes to go and the police readying themselves for a potential pitch invasion from the away fans I headed out. As I got to the corner of Highbury Avenue a huge cheer went up. I got to the car and checked the score, expecting to see one of the sides had scored but there was nothing. I can only assume the cheer was for a corner, so bad the game was. In the end Port Vale went down without a whimper and I hope for the fans sake that they find some comfort in an opportunity to be at the top end of the table next season, albeit at a lower level although I think there may need to be a big chance off the field before the good times start to roll again. 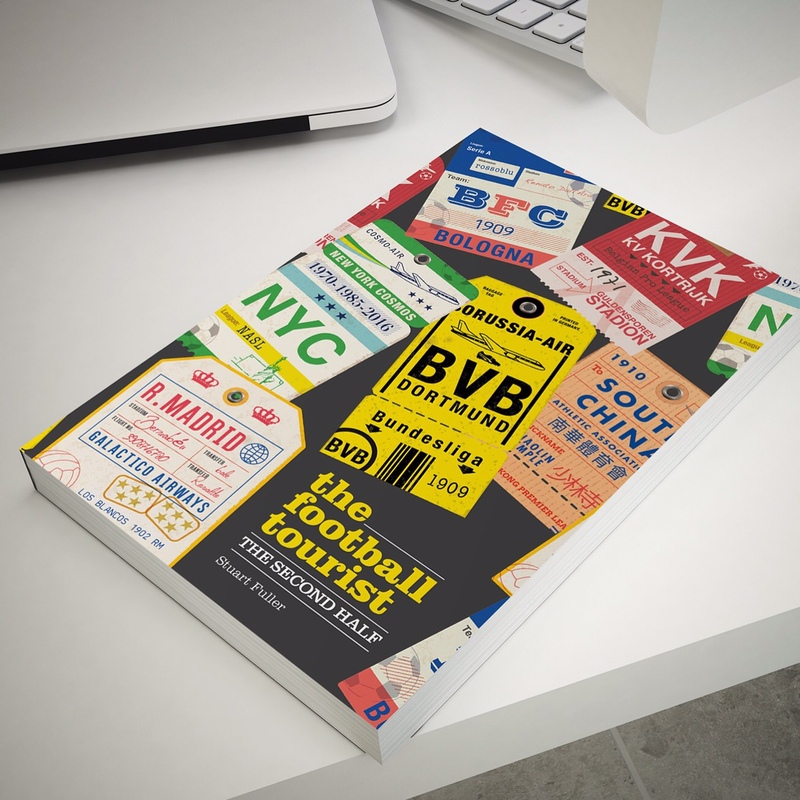 Football has moved on beyond comparison in the last forty years, mostly for the good. The anarchic process of re-election, the perfect example of the old-boys club in action, has fortunately been scrapped but that’s no comfort to Southport (although it may be for Port Vale next season!). For Lincoln City and Fleetwood Town the future looks bright. Even if the latter do not find success through the Play-offs, they will get stronger on and off the pitch, looking forward to having a local(ish) derby with at least Wigan Athletic and possibly even former Premier League Champions, Blackburn Rovers. Strong foundations built on and off the pitch, with a good local fan base can only lead to good times ahead for the Trawlermen and the Imps. Just one week later Hartlepool United, the club with the most reprieves from re-election (14 times) were relegated from the Football League after rivals Newport County scored an 89th minute winner in their game against Notts County to leapfrog United and send them down in the final minute of the season, having spent just two weeks in the bottom two all season. This entry was posted in Football League, Non league football and tagged Conference Premier, Fleetwood Town, Lincoln City, Non League, Port Vale, Southport. Bookmark the permalink. Will Chinese investment in the Premier League harm the lower leagues?